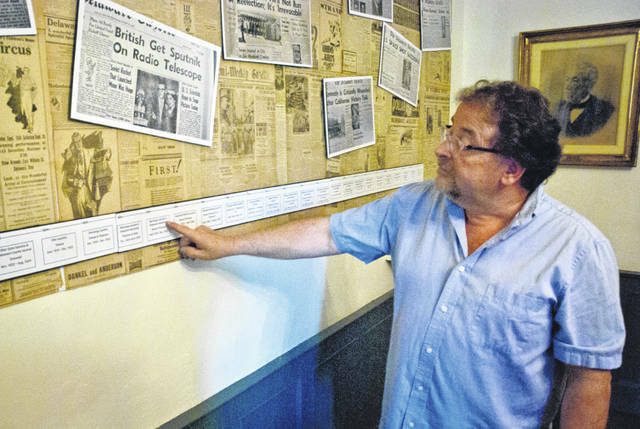 Benny Shoults, Meeker Homestead Museum curator, points to the year on the timeline that the Thompson family, longtime owners of The Delaware Gazette, became involved with the paper. Over time, the name of the paper changed many times before becoming The Delaware Gazette as it is known today. “The Newspapers of Delaware County,” an exhibit presented by The Delaware County Historical Society, will open Sunday, July 15, in the Meeker Homestead Museum. The exhibit opens the pages of 200 years of chronicled history that was provided by the stories, photos and advertisements in the newspapers of Delaware County. 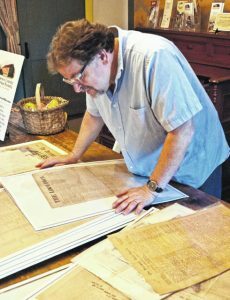 Benny Shoults, curator of the Meeker Homestead Museum, looks through the many different newspapers that at one time or another was a part of the Delaware County community. The newspaper that he is closely inspecting is the Loco Foco. Shoults said the history of the newspaper is a story that has been with us since Roman times when the Acta Diurna, translates as Daily Acts or Daily Public Records, were posted. According to Shoults, most cities, small towns and villages had newspapers that reported local, national and international news. As The Delaware Gazette approaches its 200th anniversary in October, the Delaware County Historical Society celebrates the history of Delaware County as it was chronicled in the community’s newspapers. 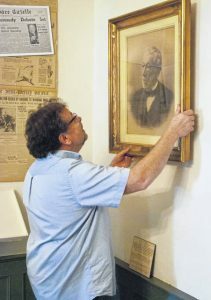 Benny Shoults, Meeker Homestead Museum curator, hangs a portrait of Abram Thompson that was donated by the Thompson family to the DCHS. Shoults added that newspapers are “probably the number one source of history” for small communities. He said even newspaper obituaries chronicled the personal history and legacy of someone who lived in the community. Shoults said that the topic of newspapers in Delaware County turned out to be very large. He said thinking about the speed news travels today, “it is mind-boggling” compared to the years before even the telegraph. He said news from other cities might have taken two or three days, maybe longer, to reach people by mail. The exhibit is open from 2 to 5 p.m. every Sunday (July 15 to Dec. 23) and during special events, as they are announced at the Meeker Homestead Museum, 2690 Stratford Road, Delaware.